Athletes can never get rid of that competitive itch. Even in retirement, it lingers. An itch that can only be scratched by a new challenge. 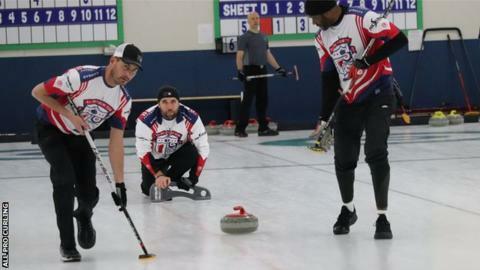 So when four former NFL pros decided to form a curling team, there was only one goal in sight - the Winter Olympics. "I've played in the Pro Bowl and I've won MVP, but I would put reaching the Olympics side-by-side with that if we could qualify," Marc Bulger tells BBC Sport. Between them, Bulger, Jared Allen, Keith Bulluck and Michael Roos have made 601 NFL appearances and played nine Pro Bowls. Former St Louis Rams quarterback Bulger was selected before Tom Brady in the 2000 draft, while defensive end Allen is perhaps the most famous of the four, having played in the 2016 Super Bowl with the Carolina Panthers. Linebacker Bulluck and offensive tackle Roos played for the Tennessee Titans. "Jared came to me about a year ago and said he wanted to be an Olympian," Bulger says. "At first he suggested badminton. I watched videos and decided there was no way we could do that. He weighs about 270lbs and while I'm not as big, it seemed badminton players were a lot smaller, more agile, and quicker. "Jared then came back with curling. We did it a couple of times and we fell in love with it." As is the case for most people, curling was a sport that only came on to Bulger's radar every four years when the Winter Olympics rolled around. But just nine months since his first tentative steps on the ice, he and his All Pro Curling team-mates are "addicted" - although it's been a steep learning curve. "It looked so easy, or at least to me it did, but it's definitely not as easy as it looked," the 41-year-old says. "My first goal for the first one or two months was to just not fall. But we have taken some pretty nasty spills. We experienced way more pain in NFL though - I think I broke over 30 bones. "That's the one good thing our coach tells us - we really have no fear. When we fall, we tuck in our chin. We know how to fall so we don't hurt ourselves. Our pain tolerance is pretty high." When All Pro announced their latest venture, their friends from their American football days laughed at them. The curling community, meanwhile, were concerned it was a "gimmick" - qualifying for an Olympics is no laughing matter. They certainly stood out physically. Allen - who recorded 136 career sacks, the 11th highest total in NFL history - is more than five stones heavier than John Shuster, skip of the USA's current Olympic champions. "At first, they didn't want us to make fun of the sport," Bulger says. "But once they saw how hard we are training, travelling as much as we are, and how serious we take it, they have really responded well to us and welcomed us with open arms. "They are helping us as much as we can because they know we are bringing a lot of attention that they have never had before." Physiologically, the team have had to adapt. As a quarterback, Bulger stood tall during matches but now adopts a crouching position to throw the stones. "I've had to do a lot more core work than I am used to in order to hold the position," he says. "Let's just say I have bird legs, so it's definitely helped my quad muscles." While they are still very much newcomers, the All Pro team have impressed. In their nine months in the sport, they have twice faced Team Shuster in competitions, and while they lost on both occasions, their progress has certainly not gone unnoticed. "We've played the Olympic champions twice now and we hung with them halfway through, but then we made one little mistake and they know how to take advantage of that," Bulger says. "We're not going to these events and embarrassing ourselves. We're just making small mistakes that we know we have to get better at. "We're happy where we are right now. The results aren't showing too much but the feedback we get from all the curlers, they can't believe we have only been doing this less than a year. They are really impressed, which gives us encouragement." Based in Nashville, Tennessee, All Pro have two coaches, including 2010 Olympian John Benton, who runs the US national curling centre in Blaine, Minnesota. The team make the two-hour flight to Minneapolis twice a month, with Benton also doing the reverse. "Two coaches and four players - we better start producing soon or they are going to get angry," Bulger says. And with three years to go until the Beijing 2022 Winter Games, he and his team-mates will want the results to starting rolling in if they are to qualify for, and win, the US Olympic trials to put them on the plane to China. For someone who spent 10 seasons in the NFL, the Olympics was an idea Bulger never entertained. Now, however, it's a different story. "The red, white and blue really means something to me," he says of the US flag. "The Olympics are on a worldwide stage. I never dreamed of being an Olympian because there was never a sport in which I could do it. "When Jared mentioned the idea, it really struck a chord with me and I was all in. It would be a miracle if we made it to Beijing. "We definitely have a long way to go but I don't think it is unrealistic."